In un articolo pubblicato tra gli editoriali e commenti dell'International Herald Tribune di oggi, il presidente dell'ASI Giovanni Fabrizio Bignami parla del futuro della ISS e delinea un nuovo, ambizioso obiettivo per la politica spaziale europea: una stazione spaziale di nuova generazione, che serva da "base di lancio" orbitante per raggiungere Marte. When the aging Shuttle brings the European Space Agency's Columbus module up to the International Space Station on Thursday and its crew screws it all together, participating nations will finally be close to using its relatively short exploitation period. Scientists from around the world will only have about 10 years to use the facility – for it is also aging, having taken a good two decades to build. Now is the time, especially for Europe, to start planning the post-space station future of manned space travel. The Shuttle will be abandoned in two years. Access to the space station will then only be possible with that old workhorse, the Sojuz, based on essentially the same technology that shot Yuri Gagarin into orbit in 1961. Now that the Cold War is over, Sojuz is open to Americans and Europeans alike, but the cost of a ticket is likely to go up. Moreover, however glorious its history, Sojuz has a limited cargo capacity. But Russian participation has had a curious consequence – it has forced the space station into a peculiar orbit, passing over Bajkonur, Kazakhstan, whence all Sojuz rockets take off, instead of Cape Canaveral, Florida, as originally planned. That is certainly an ironic fate for a space station originally conceived in the time of Ronald Reagan as a tool against the "evil empire." Now the descendants of that empire are needed to help solve a space transport problem, so the space station's orbit has had to be tilted toward the Russians. Bajkonur, however, is too far from the equator to be used for exploring the moon and the planets. And whatever its orbit, about 10 years from now the space station will have to be deactivated, owing to old-age and maintenance cost-effectiveness. Such a programmed demise is a logical part of the NASA plan, which is now concentrating on returning humans to the Moon and (possibly) building a base on it. Although the original U.S. plan appeared at some point to justify a Moon base as a starting point for going to Mars, it is now clear that this is not, and cannot be, the case. It makes no sense to land and take off from the Moon on the way to Mars, given that the original hopes of transforming lunar material into fuel were dashed on further reflection. The only way to send humans to Mars is with a nuclear-powered spaceship, starting from an outpost, a shipyard, orbiting our Earth. From a base relatively close to the equator – like Cape Canaveral or, better still, the European Space Agency spaceport of Kourou, French Guyana – one can have optimal access to such an orbit. The shipyard can be stocked using chemical, Shuttle-like propulsion. But the next leg would require a nuclear-powered spaceship, which could be assembled in space in full safety. The Kourou spaceport offers Europe an opportunity to give a long-term, post-ISS future to its manned space program. European decision-makers need to take an initiative that will establish a strong collaboration with NASA and demonstrate the innovative spirit and boldness of European industry and science. The Columbus module and the current International Space Station can serve as a laboratory and as training ground, but they can never hope to be refurbished into a launching pad for a Mars mission. Europe should therefore start thinking about a new equatorial shipyard in space. The exact type of orbit needed will have to be worked out in collaboration with NASA, according to the requirements of celestial mechanics and accessibility both from Kourou and Cape Canaveral. Certainly, the high-lift Ariane launcher, equipped with its Automatic Transfer Vehicle (which will have its maiden flight on Feb. 22 from Kourou) could come in handy for a new orbital infrastructure. Some pieces for it may already exist: three Multi-purpose Logistic Modules were built by Italy for the station station. They went up (and down) on the Shuttle. Now in storage at the Cape, the property of NASA, they await a better future. An inspiring name for Europe's new initiative could be "Lunetta," the name that Wernher von Braun gave to his own, visionary space station, designed in detail in 1949 – well before Sputnik. At variance with Von Braun's ideas, it may be more prudent not to plan continuous manning. If put on a stable orbit (unlike the ISS, which requires continuous adjustments to stop it from crashing back to Earth), astronaut-engineers could use the Lunetta as required, saving expensive trips and, at the same time, fostering robotics for on-board work. In parallel to Lunetta, Europe should start thinking about the spaceships themselves. They will have to be of Airbus size and to move fast to avoid killing the crew with prolonged space-radiation exposures. Such a combination of mass and speed calls for exploiting the most efficient, and most natural energy form – nuclear. Good ideas already exist on how best to use nuclear power for interplanetary propulsion. It's time we started serious work on it. The timing seems just right: the grandchild of Homo sapiens, Homo spatialis, will go to Mars within this century. With Lunetta, its Europaeus strain can now contribute the wheel, and even an ox to pull the cart. 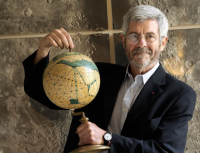 Giovanni F. Bignami is president of the Italian Space Agency and professor of astronomy at the Instituto Universitario di Studi Superiori in Pavia, Italy.